1 in 4 of your customers is on the mobile web. Are you ready?Get your business a mobile website with the full managed service from Managing Mobile.30+ mobile website features to choose fromEngage your mobile customers with Click to Call and Social Networking featuresConduct business on your mobile website with Reservations, Coupons, and mCommerce features. All goMobi sites are hosted in the cloud ensuring that we deliver fast loading, high performance sites at all times. Sites work on all mobile devices not just Smartphones! goMobi leverages dotMobi’s powerful device detection and content adaptation solutions to ensure that our sites work seamlessly on 12,000 different devices. These are constantly being developed to meet the changing needs of the business. Create custom mobile sites or automatically create sites from a desktop site in a matter of minutes or bulk create mobile sites from an existing database of content. The choice is yours. Each site has it’s own control Panel with multiple design templates, and over 30+ mobile specific features including click-to-call, maps, directions, shopping cart, video, ads, mobile analytics and much more. Automatic updates from Facebook, Twitter, event calendars and Google+. To accommodate the diverse needs of businesses around the world goMobi sites can be easily created in any of 12+ languages, each Control Panel can be displayed in any of 12+ languages and each site visitor can translate the mobile site into over 30+ languages with our unique site translation feature. See how easy it is to use goMobi by offering your customers a 30 day Free Trial. 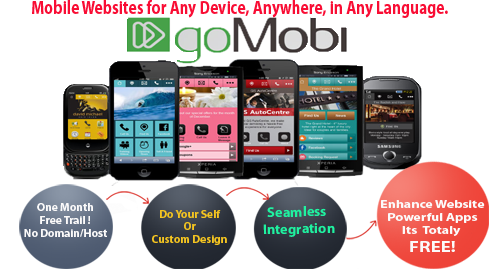 Statistics show that over 43% of customers buy goMobi after availing of our 30 day free trial. Create a custom white label solution for you and each of your downstream partners and extend your companies visibility, maximise your market reach and give you and your partners a competitive edge. Option to mass produce sites from existing business data, to use as a ‘Try before you buy’ tool; thus offering customers the ability to view how their business would look on a mobile device without having to do any work!. Multiple integration options available to suit your specific business requirements. Select from our API, cPanel/WHMC Plugin or Parallels APS Plugin. No integration options also available. Our Admin Dashboard is a powerful web interface that allows you create, manage and edit sites, generate reports, create and manage downstream partners and much more. End customer non-branded interface also available to allow your customer to access and manage their own site. Customer support Gesture provide 24/7 partner support. As no technical knowledge is required with goMobi’s intuitive and easy-to-use interface, support requirements to your customers are reduced to a minimum. Show your customer where you are, using the reliable Google Maps plugin. Multiple locations are also supported (up to 6 locations in total).